SurePayroll is a robust payroll management system designed to streamline payroll processes. It offers a one click payroll feature that speeds up and automates creating reliable and accurate payroll to save time in what would take hours if the process was done manually. The software is equipped with a number of tools and capabilities, including tax management, support for several types of payroll, and an interactive dashboard, among others. It also offers extensive record keeping aside from its comprehensive set of tools for processing payroll, as well as wide integration with leading productivity and business apps. SurePayroll is built to simplify the tasks and activities related to payroll processing. 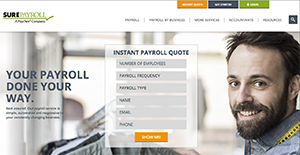 It has third-party integrations and an array of solid tools to help you handle payroll with precision, including tax calculations. The process is done with reliability and accuracy with minimal manual intervention. Furthermore, SurePayroll provides visibility for employees, allowing them to easily review information pertaining to payroll such as leaves, benefits, paychecks, and others. Information access can be done on any connected device. It automates tax deductions and manages compliance with other regulations. You also get world class customer support. Since each enterprise has specific business needs, it is sensible for them to abstain from seeking a one-size-fits-all perfect software system. Needless to say, it would be pointless to try to find such a system even among market-leading software applications. The smart thing to do would be to jot down the various vital aspects that need consideration such as required features, budget, skill levels of workers, company size etc. Then, you should do your research thoroughly. Read some SurePayroll reviews and look into each of the other solutions in your shortlist in detail. Such exhaustive research can ensure you reject ill-fitting applications and zero in on the system that presents all the aspects you need for business success. How Much Does SurePayroll Cost? Pricing is available on a by quote basis only. Contact SurePayroll directly and request a quote to get more information about the pricing. We realize that when you make a decision to buy Accounting Software it’s important not only to see how experts evaluate it in their reviews, but also to find out if the real people and companies that buy it are actually satisfied with the product. That’s why we’ve created our behavior-based Customer Satisfaction Algorithm™ that gathers customer reviews, comments and SurePayroll reviews across a wide range of social media sites. The data is then presented in an easy to digest form showing how many people had positive and negative experience with SurePayroll. With that information at hand you should be equipped to make an informed buying decision that you won’t regret. Saved a lot of time. An awesome thing to have. Loving it and highly recommended for today's small business! What are SurePayroll pricing details? What integrations are available for SurePayroll? Pros: The website is clean. Very simple to use. I can do just about anything with it. I can reach out to support and a person from the other end of the line would help me out. Great stuff! Cons: I'd love to have the ability to dig down and see something that I dislike. I've been on this platform for a few years now. So far, no issues. Pros: Even with a small firm consisting of several employees, SurePayroll made is so easy on my government and payroll work. I previously had to spend a few hours weekly processing payroll and dealing with pay checks. Thanks to Payroll, I can now input hours and consider that done. Employee pay is essentially direct deposit, unemployment cash is subtracted, and all this takes me a mere 15 or so minutes. Cons: To be honest? Nothing. I was a bit concerned with its home screen. But the latest dashboard resolve all that. SurePayroll functions reall well. It offers great service at a reasonable pricing. System is flexibile. It's capable of handling a number of issues for companies. Very confident our taxes and payroll are accurately done the right way. It's perfect and works seamlessly! If you need more information about SurePayroll or you simply have a question let us know what you need and we’ll forward your request directly to the vendor.